Virgin Galactic's SpaceShipTwo underwent its second successful rocket-powered test flight yesterday, demonstrating its "wing-feathering" capabilities for the first time. In a video announcement released soon thereafter, Virgin CEO Richard Branson stated the company is "on track for a 2014 start of commercial service." Rich space-enthusiasts, rejoice! Above: SpaceShipTwo during yesterday's rocket-powered test flight // Credit: MarsScientific.com and Clay Center Observatory. 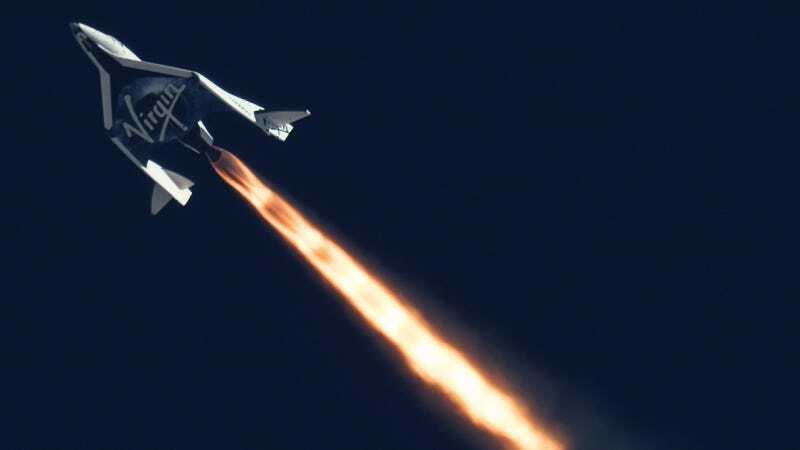 Virgin Galactic&apos;s SpaceShipTwo has made its first powered test flight! Once out of the atmosphere the entire tail structure of the spaceship can be rotated upwards to about 65º. The feathered configuration allows an automatic control of attitude with the fuselage parallel to the horizon. This creates very high drag as the spacecraft descends through the upper regions of the atmosphere. The feather configuration is also highly stable, effectively giving the pilot a hands-free re-entry capability, something that has not been possible on spacecraft before, without resorting to computer controlled fly-by-wire systems. Branson will reportedly be aboard for the SpaceShipTwo's first commercial flight. Joining him will be one of the over 600 people currently in line for a chance to soar through suborbital space. If you'd like to sign up (and have the funds to do so), we advise you to book your tickets sooner rather than later — the price jumped from $200,000 to $250,000 in April, shortly after the first successful rocket-powered test flight. Who knows how high the fee will climb in the lead-up to 2014's first commercial launch.